America's Number 1 gluten and allergen free publication. Featuring recipes, cutting edge medical information, Lifestyle and more. 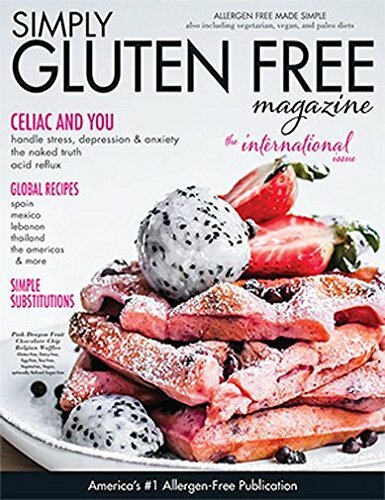 America's most popular gluten free magazine: serves as a complete gluten & allergen free, vegetarian, vegan & paleo lifestyle resource to provide knowledge, support & creative solutions through articles written by the field's top writers & medical doctors - recipes, tips, medical & personal stories. *BEST VALUE* Get 6 issues for $22.38 ($3.73 per issue) from DiscountMags.com with coupon code "43686". 9 Other Stores We also checked the following 9 stores and they do not appear to sell Simply Gluten Free Magazine: BestDealMagazines.com, College Subscription Services, DirectMagazineService.com, MagazineAgent.com, MagazineDealsNow.com, Magazines.com, MagazineValues.com, SubscriptionAddiction.com and ValueMags.com. Click on the desired price/store/issues in the grid for details on subscribing to Simply Gluten Free Magazine. America s most popular gluten free magazine, serves as a complete gluten & allergen free, vegetarian, vegan & paleo lifestyle resource to provide knowledge, support & creative solutions through articles written by the field s top writers & medical doctors - recipes, tips, medical & personal stories. America's most popular gluten free magazine, serves as a complete gluten & allergen free, vegetarian, vegan & paleo lifestyle resource to provide knowledge, support & creative solutions through articles written by the field s top writers & medical doctors - recipes, tips, medical & personal stories. Find the best price for Simply Gluten Free at MagazinePriceSearch.com!